One of the unique characteristics of SMCC, as a community college, is the vibrant student life and more traditional college experience we offer. Here you can connect beyond the classroom with opportunities to live on campus, play collegiate athletics, participate in clubs and organizations and much more. 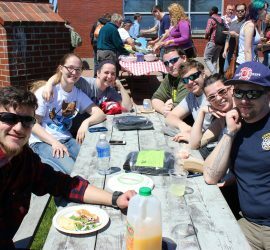 SMCC offers more than a place to get an education – it offers a place to make lasting friendships and find networks that lead to success. When it comes to living on our campuses, you can’t go wrong. You can choose to enjoy beachside living at one of our residence halls on the South Portland Campus or kick your feet up in one of our spacious suites at our Midcoast Campus in Brunswick. To learn more, visit our Housing webpage. SMCC has seven collegiate athletic teams that play a vital part in the SMCC community. Our SeaWolves athletic teams are dedicated to excellence, teamwork and respect. The best part? You don’t have to be an athlete to join in. To learn more, visit our Athletics webpage. The Center for Student Involvement and Leadership (CeSIL) provides you the opportunity to get involved in student organizations, campus activities, community service and leadership opportunities, all of which help lead to your success. To learn more, visit our Clubs & Activities webpage. SMCC provides dining plans and options to students at both of our campuses. Choose from a range of food selections and cuisines that fit your needs. To learn more, visit our Dining webpage. We know life has obstacles, and we understand how important it is to have support and resources to overcome them. At SMCC, we offer counseling services to help you manage and overcome a wide variety of challenges. To learn more, visit our Counseling webpage. We are committed to the safety of all SMCC students, employees and visitors. Our talented Safety and Security team, which includes some of our Criminal Justice students, works hard to maintain an environment that is comfortable and secure. To learn more, visit our Safety & Transportation webpage.